Solchaga is a bistro restaurant offering Spanish cuisine. Note that although GoMadrid.com strives to maintain all information about Solchaga up to date, the prices mentioned are only an indication and may not reflect the exact value of your meal. Located in the prestigious district of Chamberi. Solchaga has been a meeting place for politicians, business men and journalists since 1976. In general it is a smoke free restaurant, although there is also a small smoking zone and it comprises several cosy and elegant dining rooms which seat between 6 to 25 people. Here, Basque-Navarre regional cuisine is served in an air conditioned, bourgeoisie house atmosphere, with a classical, glamourous feel. The traditional decor features crystal chandeliers, ornate fireplaces, red walls, and tables set with white linens and the best in cutlery and glassware. The house specialities are always familiar and include Hake stuffed with Spider Crab, Lamb 'Chilindrón' (stew), and Chocolate 'Marquesa' (made with marzipan and egg yolk) with coffee sauce. It has an ample wine list also. Closed Sundays, public holidays and for the month of August. 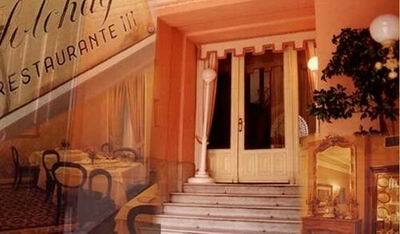 The address of the Solchaga restaurant is: Plaza Alonso Martinez, 2, 28004 Madrid. The nearest Metro station is Alonso Martínez. Please see the Solchaga restaurant location map below.